Here is a very old classical technical analysis example to trade intraday charts. All you need is the ability to identifying Slow Stochastics crossover. The Crossover’s are marked over the Nifty 5min Spot chart on 4th July 2008. Hello, I am trying to set the above standards in amibroker. 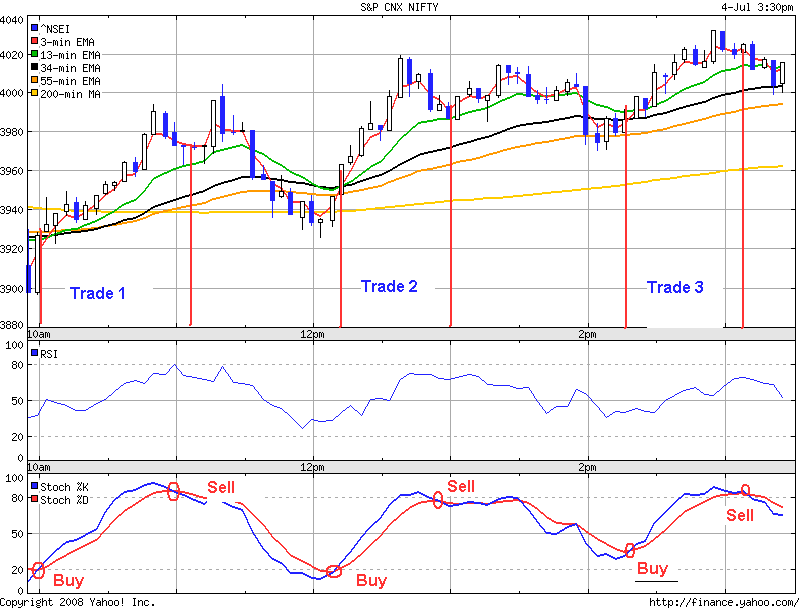 When i am selecting the time frame should i set the EMA bars for open, close or average or any other price field. Please let me know. Thanks in advance for the great work. what stochastics parameter you set for Intraday. Is it same as 14.3.3 which we use for Daily or weekly chart reading? Which is better time frame for viewing chart : 2 , 3 , 5 or 10 minutes chart? while trading what are the values to be put to set fast and slow stochastics on our online trading software ? Dear Rajandran, the sample charts shown for your explanation gets delayed values while using for on line trading for smaller profits like 5 EMA close technique. If its delayed by 1 minute also we cannot take the trade. So please let me know how to set fast and slow stochastic on our trading software. Thank you. In advance. Tony. Thats a very old technique better dont follow it. Got outdated one.